While out visiting theDaughter out in sunny California, I was kvetching, yet again, about how my cell phone can only hold a maximum of 6 photos. So to shut me up surprise me, she and theFiance bought me a memory card! So why am I bragging about a card? Because the photos today are brought to you by my cell phone. Okay, now on to the recipe. This one starts out with a box of scalloped potato mix. 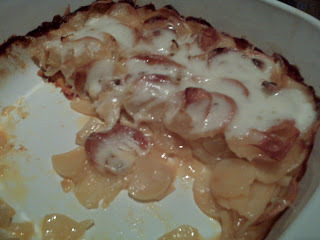 While I usually prefer scratch recipes, I have a weakness for the overpriced Passover scalloped potato mix. By adding cheese, it became au Gratin, which is French for oh great--dairy overload.